Stainless steel paella pan induction has a special flat bottom to cook with vitroceramic, induction and electric hobs. Induction paella pan can also be used with gas. 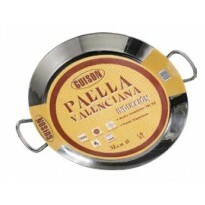 The base is thicker than traditional paella pan to avoid warping and keep the paella hot. It's a great choice for people who like to keep their pans on display. It's maintenance free, with no special cleaning required. See "Care instruction" tab.